Castalia House is dedicated to the revival of classic science fiction and fantasy. The first book in the Castalia House Classics line is the 1968 novel The Programmed Man, by Jeff and Jean Sutton. A particular favorite of several of our editors, it is a Atomic Age juvenile novel that is an intriguing intergalactic military spy thriller as well as a fascinating insight into the science fiction style of its time. 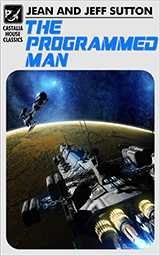 The Programmed Man tells the story of Daniel York, a Empire Intelligence agent who is rushed aboard an Imperial Navy destroyer in response to an emergency after an Imperial starcruiser unexpectedly goes missing while on patrol. The outcast mutants of the hellish Zuman worlds and the arrogant upstart Prince Li-Hu are suspects, but neither York nor his gruff companion, Captain Daniel Hull of the Empire destroyer Draco, truly know what to expect when they go in search of the missing cruiser. EPUB format. No DRM. 140 pages. Wow, I love the cover on this one – it’s the perfect blend of classic, understated style with an eye-grabbing modern touch. I’m definitely going to check this out soon.